On the border of South Coast Metro (a made-up name for an area developers thought was too genteel to be called Santa Ana), sits a Mexican restaurant that serves nothing but seafood. Better known by locals as Mariscos Clemente, this is the kind of joint that peppers the streets of Santa Ana proper, where you can't go a mile without seeing one. But the closer you get to South Coast Plaza, the frequency of these sightings diminishes to nil. 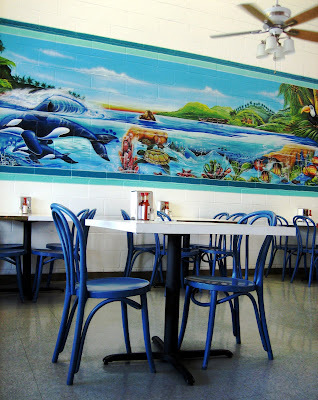 Step inside Mariscos Clemente and you quickly see why. This is a decidedly non-corporate place -- a no-frills mom-and-pop with specials xeroxed on plain paper and taped up haphazardly behind the register. But that's not to say that it isn't a pretty space. A big, fake marlin dominates one wall, and a gorgeous mural graces the other. Airbrushed on bare brick, it's artwork as pretty as anything Wyland has ever produced, featuring sea creatures frolicking in an idyllic, underwater seascape complete with a cresting wave and a waterfall. And if you haven't already guessed, there's absolutely no chance of encountering a Meximelt® or a Crunchwrap Supreme® here. In fact, you'd be hard pressed to find anything with the usual Mexican trappings of grated cheese and refried beans. The name of the game here is seafood. Lots of it. Served in cocktails, fried in tacos, and boiled in soup. My first sampling of the food (and so far, the only one after three separate visits) is their Tostada de Ceviche de Pescado ($3.25) and it's as refreshing a dish as I've ever had. 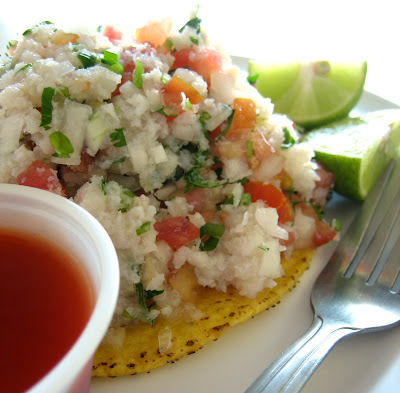 Chilled, flaked fish -- with the feel of damp cotton and the look of snow -- is mixed with cilantro, onions and tomato, then heaped onto a corn tortilla disk. A squeeze of lime perks up the cooling concoction further, making for the most briskly invigorating, and also, the most guiltless plate of food to come out of any kitchen, Mexican or otherwise. The only thing that seems like it has any calories is the syrupy sweet-and-sour sauce it is served with. And that's only because it tastes a lot like Hawaiian Punch. Although it's close to perfect, my only wish is that they used freshly fried tortilla rounds instead of the factory-produced variety seen at American grocery stores. In fact, I took advantage of the basket of the house tortilla chips (which comes gratis when you dine in) to scoop up most of my ceviche. Better by miles, these are my kind of chips: thick and sturdy like a ceramic tile, with a crunch noisier than a thousand pork rinds. Accompanying them was a thick, fiery salsa culled from milled tomato and shotgunned with diced onion. 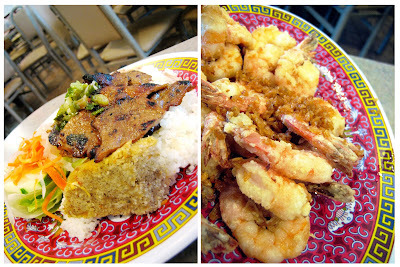 It'll remind you that despite the new high-rise, high-priced condos going up across the street, you're in Santa Ana -- and it's delicious. Japanese bakeries have something in common with other Asian bakeries: they produce cakes and pastries that feature a Zen-like balance of flavors. Less important is how much butter they can cram into the frosting, or how much sugar they can work into the batter -- a practice lamentable in American bake shops, and the reason why I never, ever buy a cake from Albertsons or Ralphs. There's no danger of such sugar shock at the Italian Tomato, which is located in a prime spot inside the ever popular Mitsuwa food court. Once diners get their fill of ramen, udon, and curry, Italian Tomato is there to entice them with sweets that aren't too sweet. 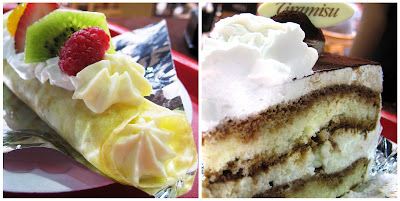 Recently, we went there specifically for an afternoon of dessert snacking and bought a pair of treats. The first was a crepe ($2.75), which looked like a cannoli, filled with a winning custard and topped with fruit. Inside and towards the center we discovered chunks of sponge cake. Although delicious, we would've preferred more custard. Better was the tiramisu ($4.00), which had a good and generous dusting of coffee/cocoa powder on top and three, feather-light layers of cake separated by whipped cream and a good soaking of coffee. It even came with a white chocolate nametag with the word "Tiramisu" scribbled in script, as if there could be any mistake. 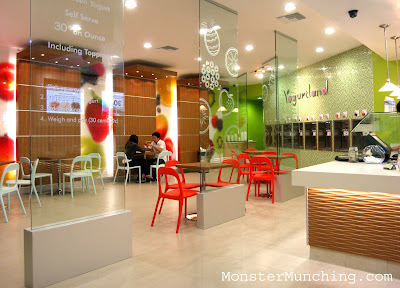 The Irvine Yogurtland finally opened today and it's much too cute -- as if Hello Kitty threw up on a Jamba Juice. Designed with a chic feminine aesthetic, it is crisply painted in muted pastels and incorporates over-sized, softly-focused glamour shots of fruit. The furnishings are by IKEA, and in the middle of the room, vertical panes of stenciled glass grow out of the floor and into the ceiling. They separate the space in two and await some poor sap with fro-yo tunnel vision to run right into the see-through surface like a disoriented bird into a window. This is a decorative element full of slapstick-comedy potential; but one that makes this Yogurtland the prettiest, little frozen yogurt shop in Orange County. Evidently, with the money so well-spent on the interior designer, none was left over for a proofreader. On a large plate glass plaque etched with verbiage extolling the virtues of yogurt, spelling slip-ups, grammatical gaffes, and embarrassing "Engrish" run rampant. A copy editor would be reduced to tears, but we were more than slightly amused as we saw it on our way to the yogurt machines. There are eight machines in all, located at the back of the store, inset behind a green tiled wall, and invisible save for their spouts, which output sixteen different flavors. And as this is essentially a yogurt buffet, our journey begins at the first one with a styrofoam or plastic cup. But before dispensing, we start by surveying the options first. The reason? A more enticing flavor will be inevitably found further down the line, and we want plenty of vacant space in our cup to allow for it. Like many post-Pinkberry yogurt stands, fresh fruit, nuts, and cereal await at the next stop after pouring: the topping station. 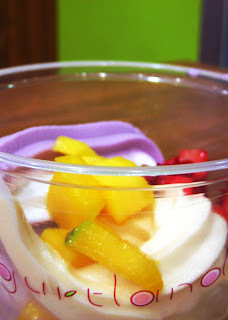 I choose chopped mango and strawberry to crown my self-styled plain yogurt/blueberry/mango frozen treat. It is my opinion that fresh fruit is a better complement to yogurt than those macerated, syrupy preserves found at fro-yo joints established in the pre-Pinkberry era. In fact, it's not a stretch to say that it is one of the reasons for Pinkberry's success. Finally, when I'm good and ready, the last stop is the weighing station and payment, where I will be charged $0.30 for every ounce of yogurt and topping. I average between $2 to $3 for a serving of dessert that more than satisfies, and with less hype than Pinkberry. Close to home, this Yogurtland will be my go-to frogurt stand; girly-decor and bad grammar notwithstanding.